Dozens Of States Resist Trump Administration Voter Initiative : The Two-Way The states say that they won't comply with a White House commission request for the personal data. Even a commission leader isn't able to turn over all of his own state's records. The request for the voter data came in a letter Wednesday to all 50 states from Kansas Secretary of State Kris Kobach, who is vice chair of the new Presidential Advisory Commission on Election Integrity. The president established the commission after he alleged, without providing evidence, that as many as 5 million people voted illegally last November. The panel — headed by Vice President Pence — has been charged with looking into voting problems and recommending ways to improve public confidence in elections. 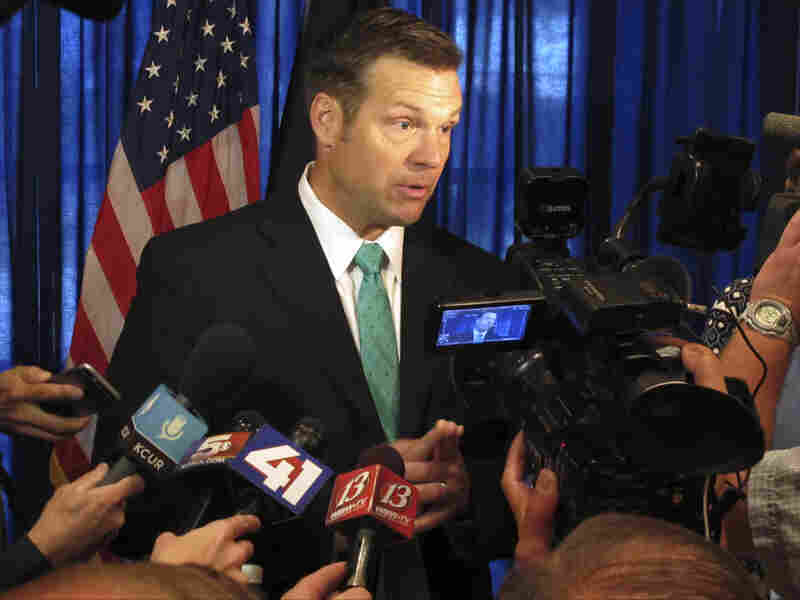 Kansas Secretary of State Kris Kobach, seen earlier this month, says he is among the state officials who isn't able to provide all the voter identification details the national commission he vice-chairs is seeking. The letter asks each state to send the panel all publicly available voter registration information by July 14, including the names, addresses, birth dates, partial Social Security numbers, party affiliation, felon status and other data for every registered voter in the country. Several states said they would not comply because of concerns about the panel's motives and how the information would be used. "New York refuses to perpetuate the myth voter fraud played a role in our election," New York Gov. Andrew Cuomo said in a statement. "We will not be complying with this request and I encourage the Election Commission to work on issues of vital importance to voters, including ballot access, rather than focus on debunked theories of voter fraud." They can go jump in the Gulf of Mexico and Mississippi is a great State to launch from. In an interview with NPR's All Things Considered host Ari Shapiro, Kentucky Secretary of State Alison Lundergan Grimes said she too would not comply because of her concerns about how the data would be secured. "I'm not going to risk sensitive information for 3.2 million Kentuckians getting in the wrong hands, into the public domain and possibly for the wrong reasons, to keep people away from the ballot box," she told Shapiro. Grimes and other Democrats say they worry that the commission's findings will be used to legitimize efforts by Kobach and others to enact strict ID and other voter requirements around the country. In response, Kobach told NPR's Shapiro that the commission was requesting the information so that it could "understand issues of voter registration fraud. ... If you don't have the voter rolls, the commission really will have a hard time studying problems of voter registration." Kobach said that the panel was only requesting data that "any person on the street can walk into a county election office and get. It's not sensitive information at all," a characterization many election officials dispute. Kobach said the panel would like to compare the state rolls against federal Social Security Administration and citizenship databases to see if there are those on the rolls who have died or are noncitizens and whether anyone voted in their names. "We have lots of people making claims on both sides about fraudulent voting in the name of dead people," he said. "Well, let's just use the federal databases and find out how big a problem it is." Many experts say the problem with comparing such databases is that it often leads to mismatches because of inaccuracies or differences in how names are listed. Some voting rights groups worry that it could lead to legitimate voters being purged from the rolls, even though Kobach noted that the federal panel would have no authority to do that. In his statement announcing refusal to comply with the request, California Secretary of State Alex Padilla, a Democrat, noted that Kobach has a history of pushing tough voter requirements, which opponents say can hurt minority voters. "His role as vice chair is proof that the ultimate goal of the commission is to enact policies that will result in the disenfranchisement of American citizens," Padilla said. Kobach said he found such arguments "bizarre." He acknowledged, however, that the panel does not have the authority to force states to comply with the request. "It's simply an ask," he told NPR. While the strongest opposition has come from Democrats so far, several Republican secretaries of state, including Tennessee's Tre Hargett, said they would be unable to comply because of state restrictions on sharing sensitive data. "Tennessee state law does not allow my office to release the voter information requested to the federal commission," Hargett said in a statement. Mississippi Secretary of State Delbert Hosemann, also a Republican, said he had yet to receive the commission's request but that his reply to such a request would be: "They can go jump in the Gulf of Mexico and Mississippi is a great State to launch from." He cited the need to protect the privacy of state citizens "by conducting our own electoral processes." Ohio Republican Secretary of State Jon Husted also said that confidential state information would not be shared with the commission. "We do not want federal intervention in our state's right and responsibility to conduct elections," he added in a statement. Wisconsin's administrator of elections, Michael Haas, said that his state's voter registration data are available, but for a fee of $12,500. One of the Democratic members of the commission, Maine Secretary of State Matt Dunlap, said he was reviewing Kobach's request to see whether the state can comply. Under Maine law, recipients of state voter data are not allowed to share the information or make it public, but Kobach's letter says anything sent to the White House panel will be available to the public. And in a bizarre twist Friday afternoon, Kobach revealed in an interview with the Kansas City Star that even he wouldn't be providing the panel with all the information requested. He said his state will not be turning over Social Security numbers at this time. "In Kansas, the Social Security number is not publicly available," he told the paper. A previous headline stated dozens of states have rejected the administration's voter initiative. While most states have resisted the initiative, more than a dozen have rejected it. Additionally, we incorrectly said Kris Kobach was the former Kansas secretary of state. He currently holds that position. Previously posted July 3: A previous update to this story incorrectly said that the number of states refusing to fully comply had doubled as of Saturday.